I hated mushrooms during my childhood and almost gagged with every mouthful. I would avoid them at all costs, even developed a “mushie-phobia”. I would feel sick as soon as I caught a glimpse of my mother chopping them up. Perhaps it was the rubbery texture that threw me off? I’m not sure. Nowadays, I love them: oyster, enoki, shitake, shimeji, button, swiss brown, chanterelle, porcini, …cooked any style. I don’t remember how or when I got over my phobia, but I’m glad I did. Have you suffered from a food phobia as a child and grown to like the same food as an adult? 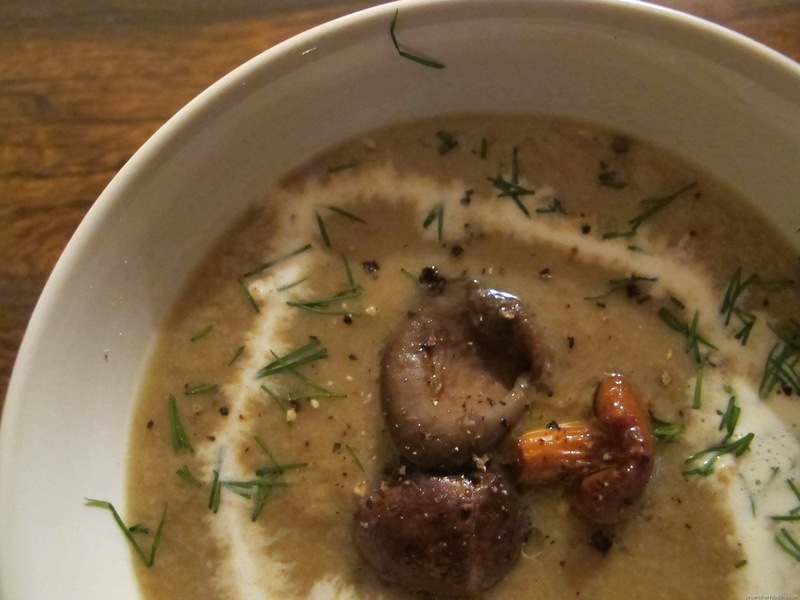 The inspiration for this dish came from a spoonful of porcini mushroom soup which I’d tasted at Vetro, an Italian restaurant in Mumbai. Instead of porcini, I’ve used a mix of chanterelle, oyster and swiss browns. You can use any type that you like. I made this recipe up and served it as part of a 7 course dinner at home. It’s very easy to make and very tasty! In a saucepan, melt the butter, saute onion until translucent, then add garlic and cook until garlic is soft. Add the mushrooms, cover and cook on moderate heat for about 5 minutes, until the mushrooms have softened. Add the stock, bring to the boil, cover and simmer until the mushrooms are tender. Take off the heat, add half the cream. Use a stick blender or food processor to blitz until smooth. 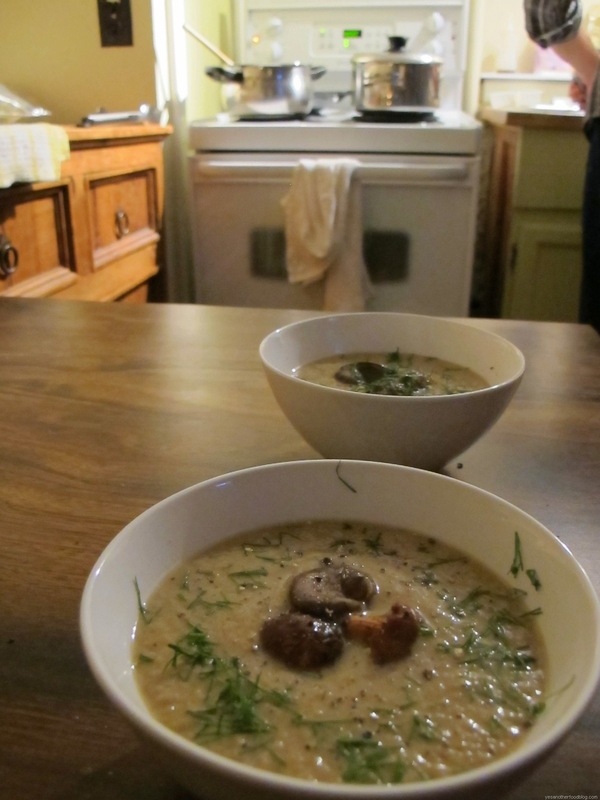 Ladle into small soup bowels, drizzle the remaining cream and then arrange the roasted mushrooms in the centre. Add salt and pepper to taste. Serve warm with croutons (not shown) and garnish with dill.